It appears that Pope will bring in all new faces, quite likely former UVU assistants Cody Fueger and Chris Burgess and former SUU coach Nick Robinson. (Trent Nelson | The Salt Lake Tribune) BYU wing Zac Seljaas (left) says the Cougars are "excited and ready to go" with new coach Mark Pope after the Utah Valley coach was named BYU's new coach last Wednesday. Provo • Noticeably missing when Mark Pope was introduced at BYU’s Broadcasting Building last Wednesday were the guys who will play for the new head men’s basketball coach next season. There was a reason for that, senior wing Zac Seljaas said a few days later. Seljaas said after the news conference Pope walked over to the Annex — where his new office overlooks the practice courts — and watched the players do their thing. Their absence at the Broadcasting Building should in no way be seen as a sign that they are unhappy with athletic director Tom Holmoe’s choice, Seljaas said, although he acknowledged that it would have been good, too, if four-year assistant coach Quincy Lewis had gotten the job, for continuity’s sake. Lewis, the former Lone Peak coach, had told BYU administrators that he wasn’t interested in any position but head coach, so he obviously won’t join Pope’s staff now. Lee Cummard and director of basketball operations Andrew May have said they would love to stay on, but it appears Pope is going in a different direction. With Los Angeles Lakers assistant Mark Madsen introduced Monday as UVU’s new coach, it is likely that Pope will go after UVU assistants Chris Burgess and Cody Fueger and Seattle assistant Nick Robinson (the former SUU head coach) as his new assistants at BYU, sources say, with UVU’s Bobby Horodyski the new director of basketball operations in Provo. Cummard was a BYU graduate assistant in 2016-17 and 2017-18, and the third assistant last season. He was around the program a lot when he wasn’t playing overseas before 2016 and was extremely popular with the players. Seljaas said the current players were not introduced to any of the candidates, but some were familiar with Pope because he was retired coach Dave Rose’s assistant from 2011-15. The rising senior said Pope’s first message to the team was full of hope and optimism. With Jahshire Hardnett and Rylan Bergersen entering the transfer portal, Yoeli Childs moving on to professional basketball and Luke Worthington and McKay Cannon graduated, Pope will have a scholarship or two available for this fall, depending on what happens with rising senior Nick Emery, who wasn’t on scholarship last year. Seattle-area point guard Pierre Crockrell II mentioned on Twitter this Sunday that Pope recently had an in-home visit with him; Also, UVU graduates Jake Toolson and Baylee Steele recently entered the transfer portal and could foreseeably follow Pope to BYU, although it is not likely. The 6-foot-11 Steele visited Duquesne on Sunday and told Pittsburghsportsnow.com that he is drawing interest from several high majors. • Point guard Jahshire Hardnett is in the transfer portal as a grad-transfer. • Junior wing Rylan Bergersen is in the transfer portal. • Senior forward Yoeli Childs has hired an agent and put his name in the NBA draft. 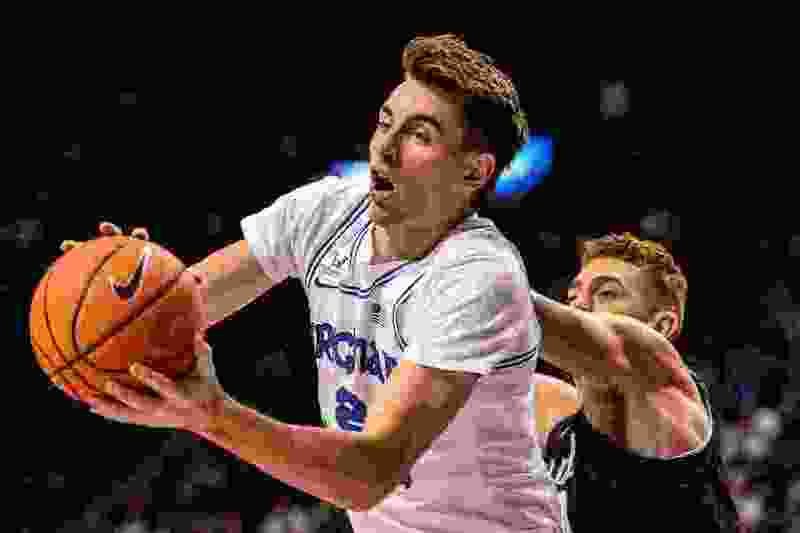 • Guard McKay Cannon has exhausted his eligibility and plans to work on the family’s farm in Idaho after his wife’s eligibility as a member of BYU’s track team ends next winter. • Forward Luke Worthington has exhausted his eligibility and was planning to be a graduate assistant coach before Dave Rose’s retirement. His status on Pope’s staff is unclear.